Antibiotics are often discovered in nature, where they are lethal weapons in the fight between different organisms. The aminoglycoside antibiotics, such as streptomycin, are made by some bacteria to protect themselves from competing bacteria. They are particularly effective because they are specific: they attack bacterial ribosomes, corrupting protein synthesis in the bacterium, but they don't attack the ribosomes of many other organisms, including our own ribosomes. This makes them perfect for use as antibiotic drugs--they will control a bacterial infection but have few side effects on our own cells. As is often the case, streptomycin and other aminoglycoside antibiotics were discovered through their ability to kill bacteria, and then scientists had to figure out how they worked. These antibiotics have several effects on bacterial protein synthesis. They effect the way that messenger RNA is read, causing errors in translation and inhibiting the orderly stepping of the ribosome along the mRNA strand. They also cause problems at the end of protein synthesis, blocking the recycling of ribosomes after they are finished making a protein. A series of new structures, solved in collaboration with researchers at CSMP, have revealed the atomic basis of both of these effects. Structures of whole ribosomes with the antibiotic drugs neomycin, gentamycin and paromomycin have shown that there are two different binding sites. One site is in the small ribosomal subunit. The drug wedges into one of the ribosomal RNA helices at the site where the mRNA is matched with the appropriate tRNA, blocking the subtle motions needed for decoding and translocation. The second site is on the large ribosomal subunit, binding to a small loop of ribosomal RNA that interacts with ribosomal recycling factor (RRF), the protein that assists the recycling of ribosomes. 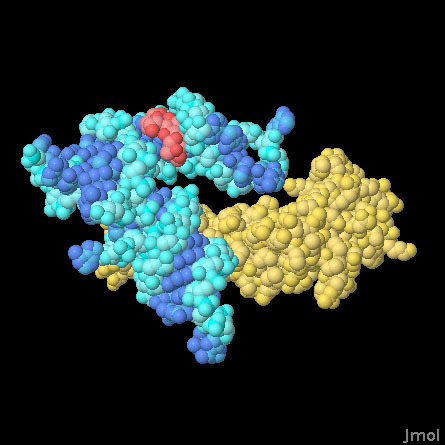 The structure shown here (PDB entry 2qbi) shows the complex of a ribosome (blue) with RRF (yellow) and the antibiotic drug neomycin (red). The small subunit of the ribosome has been removed to show the interaction, which is normally buried deep inside the intact ribosome. RRF interacts with a small loop in the ribosome, which is important in the interaction between the large and small subunits. By comparing this structure with a similar structure of the ribosome and RRF without the drug (PDB entry 2qbe), researchers have discovered that the antibiotic distorts the structure of this loop, freezing the motions that are necessary for recycling. To take a closer look at the interaction between the loop, RRF and the antibiotic, click on the image below for an interactive Jmol. This Jmol image shows only a small section of the large ribosomal subunit (blue) along with ribosome recyclic factor (yellow) and the antibiotic neomycin (red). Two structures are shown--one that includes only RRF and the ribosome (PDB entry 2qbe), and one that includes the drug (PDB entry 2qbi). Use the buttons below to switch between the two structures, and notice that the drug distorts the RNA helix, pulling it away from RRF. Borovinshaya, M. A., Pai, R. D., Zhang, W., Schuwirth, B. S., Holton, J. M., Hirokawa, G., Kaji, H., Kaji, A. 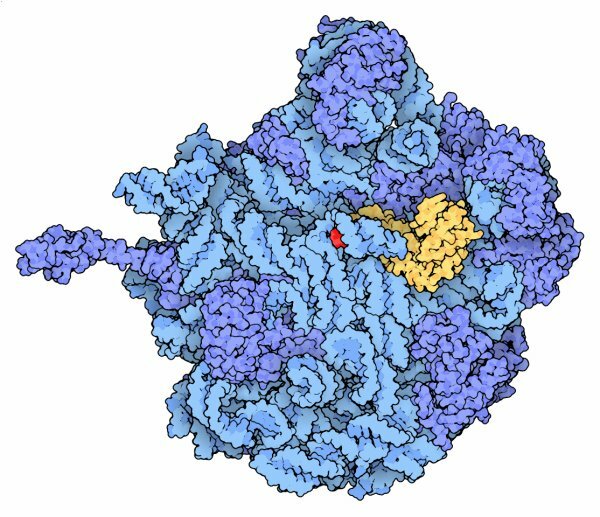 & Doudna Cate, J. H. (2007) Structural basis for aminoglycoside inhibition of bacterial ribosome recycling. Nature Structural and Molecular Biology 14, 727-732.